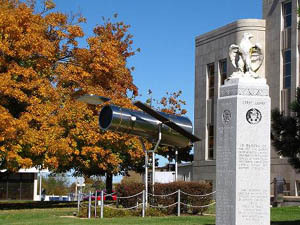 If you're making Marshfield, Missouri your vacation destination or just passing through, we welcome you to stay for a while and visit one or two of our interesting attractions , such as the Hubble Space Telescope Replica Or perhaps your timing is just perfect to take part in an exciting event. We know you'll enjoy the . Browse Marshfield's shoppes for gifts, good restaurants, and places to stay overnight. For outdoor fun go fishing or camping at a nearby lake or park, or just take a short day trip through our scenic countryside. We want your trip to be a memorable experience so you can tell all your friends, "Make sure to stop and visit Marshfield, MO"
We are happy to provide you with a brief description of what Marshfield, Missouri has to offer, but this isn't all! For more in-depth tourism and travel information such as sites and shopping, entertainment, events, lodging, real estate and more please contact us and let us know! Marshfield is the hometown of the famous astronomer, Edwin Powell Hubble. He was born on November 29, 1889 to an insurance executive in Marshfield and passed away in California on September 28, 1953. Originally this 420 acre farm was a part of the 850 acre Hosmer Dairy Farm established in the late 1880's by Edmund J. and Eliza J. Hosmer. This farm pioneered the dairy industry in Southwest Missouri. By 1916, the Hosmer Dairy Farm was the largest butter dairy farm in the state.